These photos were taken in April 1997 by John Wells and Gabriel Parsons. Allow pictures time to load. 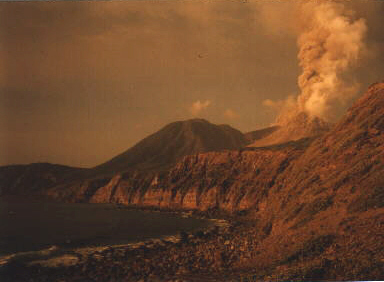 1.1 The dome of the new volcano, seen from Spanish Point. 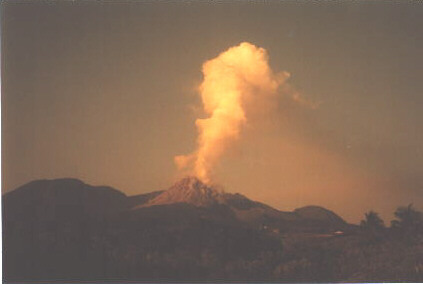 Above is the plume of the ashcloud. 1.2 The dome, seen from the shore at White's. At far left (scarcely visible) is the new delta spilling over the clifftop. 1.3. 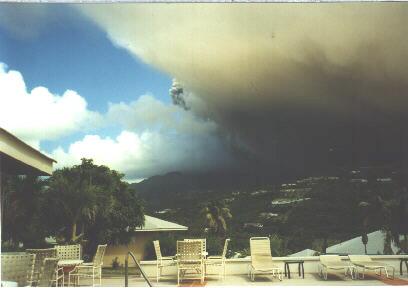 An ash cloud threatening Plymouth, seen from the Vue Pointe Hotel in Old Town (which was unaffected). 2.1 Brades. 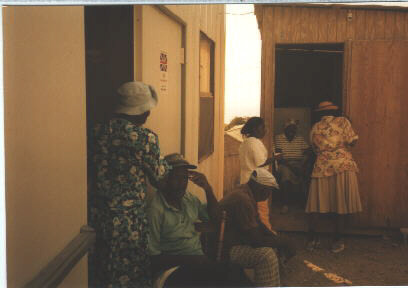 People evacuated from the 'unsafe' zone outside their temporary homes in specially built emergency shelters (one of aluminium, one wooden). 2.2 Geralds Park. Gabriel Parsons talks to Annie Markham, an evacuee living in her own house, which has been transported here by truck. 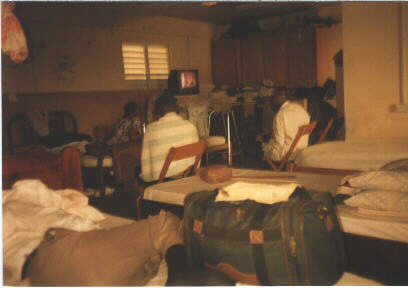 2.3 Cavalla Hill, interior of the shelter for elderly people in need of care. To the rear, women's beds. To the front, men's beds. Note the cramped conditions and the lack of privacy. 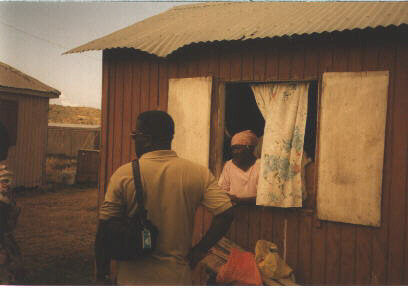 The new Home for the Elderly planned by the Montserrat Red Cross will relieve this situation. 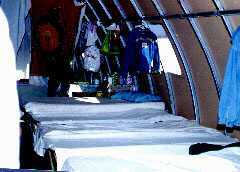 Here are some further pictures of the shelters, taken from the Montserrat Reporter.